Set in 1858, this delightful historical fiction is an easy and informative read. The children’s book is based on a real incident in Colorado history, but the adventures of 10-year-old Emmy is pure fiction. If I were to summarize the point of the Quilt Walk, it would be about to gently expose children to the reality of the world. Emmy has lived a sheltered life, and now is on the wagon train, where life, death, kindness, and meanness all intertwine. She is growing up. In that light, one subject the book addresses, without dwelling on it, or making it scary, is domestic violence, as we encounter a mail-order bride who is subsequently physically and verbally abused, though not graphically. I was surprised to see this in a children’s book, and yet it has been a part of life for a long time. In the end, the other women help extricate the young bride from a dreadful situation, and the ending of the book is particularly satisfying for her. If you are not ready for your young girl to encounter this, even though it is done with compassion and gentleness, then this particular book might not work. 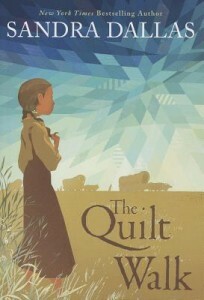 In addition, The Quilt Walk is a great example of how historical fiction can make history a living experience for students. I can see it easily being used in a 5th grade classroom, for example, to study American history. It could also be used to support a handwork curriculum when older kids are learning about quilts. Sandra Dallas is a talented author I’ve just discovered, whose historical fiction children’s books don’t shy away from difficult historical issues for children. In addition to this book, she also wrote Red Berries White Clouds Blue Sky.